Goal-oriented Account Analyst dedicated to high levels of customer satisfaction and meeting aggressive business goals. 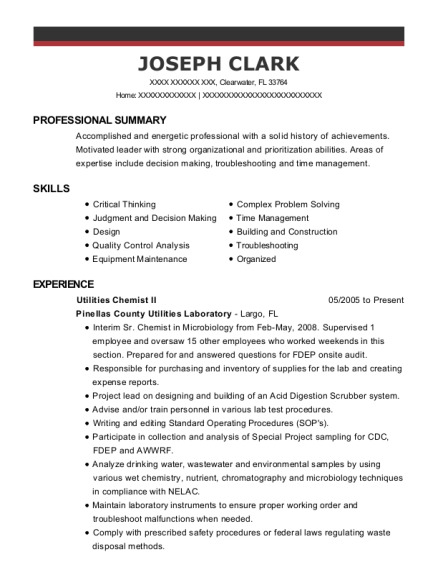 Accountable and proficient with specialized knowledge in contract administration, including loading, pricing, issue resolution and reporting. Work directly with Account Managers to obtain documentation required to support the new customer implementation process. Obtain and analyze supporting contract documentation from both GPO and suppliers to confirm contract eligibility. Load customer to GPO base, tiered and RX contracts through CAMS/E1 system based on supplier documentation. Provide updates via conference calls and emails regarding implementation status and to assist with related issues and resolution. Run reporting to ensure contract accuracy. Partner with Contract Operations to ensure successful transition of customer for the ongoing maintenance process. Adhere to department service level and quality standards as supported through the quality control process. Extract data from multiple systems (SMO, BO, BW, Access). Maintain the Item Substitution Maintenance (ISM) tables for each account. Conduct quarterly audits on all accounts, review DMEM, Payment Terms, and Cost of Goods. Responsible for Autoship distributions as requested by customer. Conduct or participate on weekly conference calls to review new business and outstanding issues. Day to day support with credit, delivery, pricing, and problem resolution. Built successful partnerships with the regional sales managers and staff at supported distribution centers. Responsible for supporting the Texas Heckman Group and North East Region. Prepared and mailed business reviews as requested by the regional sales managers. Supplied new product information or promotions though BlastFax. Provided world class customer service through day to day account support, problem identification and resolution. Ran monthly adhoc reporting for independent pharmacies as requested using Business Objects. Monitored Kronos payroll system for missed punches and zero hours, distributed timesheets, and sorted checks. Provided administrative support in the areas of compensation, benefits, new hires, salary changes, terminations and garnishments for 1000 employees. Reviewed and processed education assistance request forms and reimbursements. Administrative support for corporate travel card program including issuance, cancellations, and delinquencies. Created and maintained employee personnel, medical and confidential files. Interaction with providers regarding Short Term Disability, FMLA, and Workers Compensation. Coordinated and organized Healthfair, flu shots, lunch and learn programs. 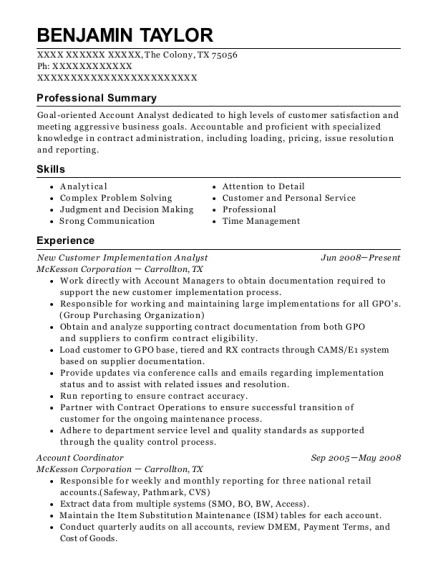 This is a resume for a New Customer Implementation Analyst in The Colony, Texas with experience working for such companies as McKesson Corporation and McKesson Corporation. 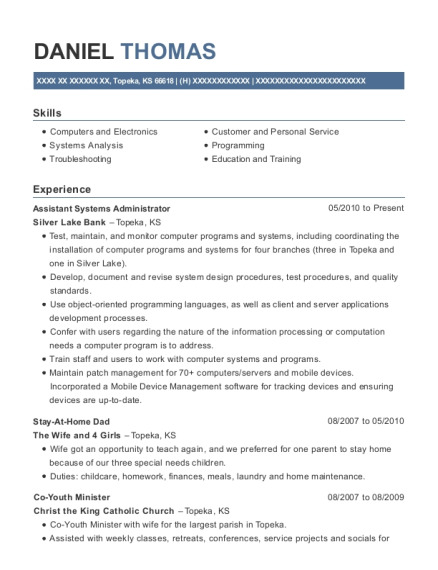 The grade for this resume is 0 and is one of hundreds of New Customer Implementation Analyst resumes available on our site for free. 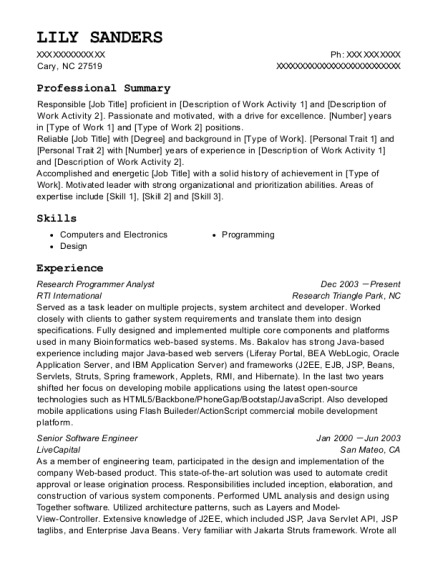 Use these resumes as templates to get help creating the best New Customer Implementation Analyst resume.